The Front Page - TWC 2015 MODDING AWARDS: WINNERS REVEALED! 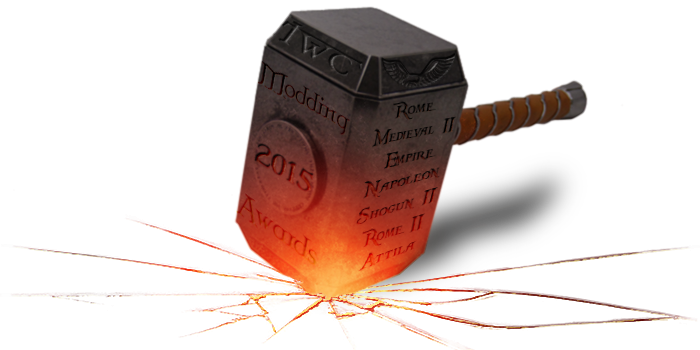 we are very pleased to inform you that the TWC 2015 Modding Awards are finally over and that, consequently, the winners have been revealed! We are happy to say that, with the official end of this Award we have finally closed the gap with the past and that we will soon be helding the 2016 edition (for the records, it is planned to start by end of January 2017). As more than once said, this is a voluntary task and even though we want to apologize for the delay in helding 2014 and 2015 editions, we are also convinced that with the effort we made this year we did a great service to both the site and the community and that we have hence regained the trust and respect of the whole membership (and not just of it, probably); this can be seen from the huge amount of voters we had in the last edition and in general from the increased interest the whole community showed for it (see below for more details). Hammers might be heavy, but it's easy to hang a medal on your breast! With the introduction of Attila in 2015 one could expect some new names to pop up, but this is not the case this year: as a matter of fact there's quite a lot of continuity in the work of modders, and with the use of the same engine in the latest titles, it's not so surprising to find the same names over different titles. In particular, both Radious and Swiss Halberdier are standing out of the crowd, with three podiums each (Radious was 1st runner up in both Attila and Rome 2 sections and 2nd runner up in the Shogun section, while Swiss Halberdier won the main prize in the Napoleon categories and ended up as 1st runner up both in the Shougun 2 and Empire sections); not surprisingly, the never-fading star of Dresden is shining like never before, as he won both in the Attila and Rome 2 (where he also repeat the victory of 2014 edition) sections; very well done sir! To conclude the list of the multi-winners we need to mention one of the eldest modders of TWC, is to say KLAssurbanipal, and his awesome models: coupling the victory of 2014 edition in the Rome section with his 1st runner up position he also imposed himself to the attention by achieving the 2nd runner up in the most recent Attila title. Scrolling the list of the old timers who have been awarded this year, it's easy to notice the name of uanime5 (a master of the Shogun 2 modding, with his victories and 2nd runner up in 2013 and 2014 editions, respectively) who confirmed himself again with a new victory this year in the Shogun 2 section; it is also pleasant to see the name of Steph brought to glory again, thanks to his 2nd runner up in the Napoleon section, hence scoring his 4th podium in 4 years, which is quite something I would say. Lordsith too confirmed his talent and the appreciation he receives from the community by ending up as 2nd runner up in the Empire section after he won both 2013 and 2014 editions. Medieval 2 section registers the confirmation of Arachir Galudirithon, who repeated the victory of 2014 and imposed himself as the favourite modder for that title, and it's not a small thing, considering how the game is still very followed by members and guests alike. Last but not least, the legendary Gigantus: what to say about someone who has been chosen by the community for 7 years in a row? Hats off gents! For what concerns the newcomers, we have few of them this edition. Well some of them are not exactly newcomers: people like Bethencourt (winner of the Empire section) and Magnar (2nd runner up in the Rome II section) have been around for quite a while and were honestly deserving a recognition from the membership, so well done gents to both of you, this is indeed deserved! The list is completed by Hummingbird (1st runner up in the Medieval 2 section), Philadelphos (winner of the Rome section), b0Gia (2nd runner up in the Rome section) and Lord Davn (1st runner up in the Napoleon section); to all of you gents I wish to say: this is just but the beginning, there's plenty of opportunity for you to grow and to expand your palmarés, so, ad maiora! For the complete list of mods, hosted mods and submods that have been awarded, please refer here. Overall, we had more than 1350 votes this time, which is a very significant number. In general, Medieval 2 got the lion's share, with a total of 540 votes over 3 categories, which is not surprising: we can all agree that this title is still the most played by people, at least for what concerns mods. The others titles scored between 60 and 150 votes each, with Rome II and Attila (4 categories each) being on the top. Despite being an old title, Rome is still getting a decent amount of votes, mostly thanks to those awesome modders that are still investing their time in it; Napoleon, Empire and Shogun all scored around 70-80 votes each, which is quite the standard for those titles since when they have been included into the Awards. As said above, the participation and the interest showed by the membership has seemed to be significantly higher than in the past editions (2014 mainly, due to it being so late in time) and we are happy to register that, despite the little success (on papers) of the vanilla versions of games such as Rome 2 or Attila, there is still an alive and productive modding community that lives around and for them. Overall we are all satisfied with the results of this edition and we are also very happy to see that many great deserving modders and mods have been rewarded; we hope to see more in the next future and we will work at our best to supply you with the best Modding Awards ever as soon as the 2016 edition will be launched (actual plan is by the end of January 2017). Once again, I wish to spend few words of praise for those who helped run this edition of the awards because without the hard work of these volunteers there won't be any Award actually. As told on our precedent article about the 2014 Awards, the Modding (and the Site) awards are competitions run by volunteers and there won't be any of them, without the commitment, work and passion of those great lads. For more info on how to participate or help with the awards please refer to the link above, or Pm either Hader or Flinn. And that's all for this edition, see you soon gents! Important notice: it has come to my attention that there might be confusion about the medals that go along with the awards. Medals are only given to the modders who won or ended up as 1st or 2nd runner up for each title; there are no medals for mods (irrespective of the title) as it has always been customary here at TWC. The reason is simple: it's impossible to define which members were active (and hence deserving the direct recognition) at the time of the release that has been voted for in each single Modding Award, and hence it would make it unfair to reward just some of them or even someone who was not present at the time. It is obvious that any winning mod has the right to update its OP stating that the mod was awarded from the community and every member of the modding team/supporter is free to update his signature accordingly. If you are looking forward for help with graphical stuff for this purpose, you can refer to the Graphics Workshop for help. The combined input of the team has once again delivered a great competition, thanks to all - rep incoming. You are old Gig, as much as you try to avoid remembering this fact It's seven years indeed, 2015 included. I'm sure you are looking forward for more! A huge compliment for you guys! Thanks for this very informative review! Thanks a lot also to the Modding Awards Team for their big effort to organize the awards! Congratulations to all of the winners and participants, and a huge thank you to everyone who volunteered to make the awards happen. Modding keeps the community alive, and these awards drive home that point! Can I have my cookie now ? Joke aside, it's been a pleasure again to be part of the committee. I want to take my hat off to all the minor mods out there, which doesn't get any of the free exposure that comes with the bigger mods and their submods. Thanks for being part of this massive flag ship of modding! Also, many familiar faces. I remember working with uanime5 back in M2TW for the fun Eras mod. Good to see. Magnar is a trooper when it comes to modding tutorials on YT. And all you other nuggets, Merry Christmas and all that.